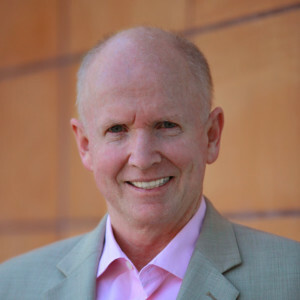 Why work with Stanton Chase to hire your next CFO? How do you replace your CFO? CEO and Investors: Are you ready for your First CFO? You will notice that in these blogs I discuss why you should be using an executive search firm to hire your Chief Financial Officer. 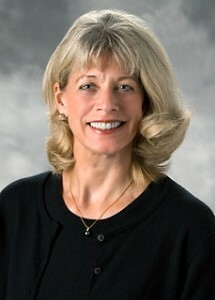 I have not, to date, written about why you should work with Stanton Chase to hire your next CFO. I could list generic reasons here, but the reality is that as a company looking for your next Chief Financial Officer, you have challenges in your search that are specific to your situation. This is where the CFO Search Team at Stanton Chase can help. If you are looking to hire your next CFO, before you make your decision on an executive search firm, you should consider Stanton Chase. For more information on Stanton Chase’s CFO Executive Search Practice, Process and Team, complete the form below to receive a copy of our brochure. When we started the CFO Moves Blog in September 2011, our goal was to track CFO Movements (Hires, ‘Unhires’ and Appointments) across the United States on a weekly basis. Our information comes to us from news releases and articles, as well as information provided to us by companies and CFOs. The information reported weekly is not a report an all CFO Movement in the country, but is (in my opinion) an indicator of overall CFO Movement. The good news is that CFOs are continuing to get hired in this economy. 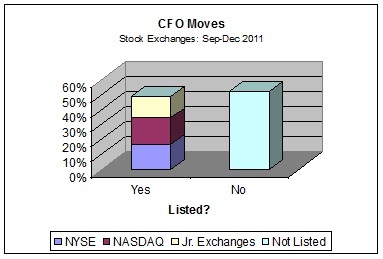 Here are two indicators of where CFOs move. Almost one-quarter of all CFO Movement reported was in California. The next 4 states with high CFO Movement were New York, Texas, Massachusetts and Florida. 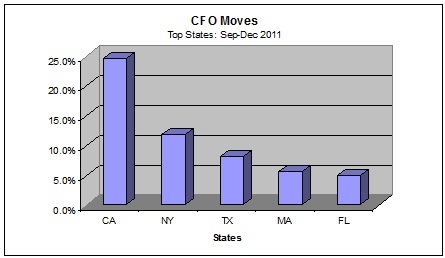 We also noticed that almost every state was represented in our CFO Moves Blog in 2011. • CFOs are hired all across the United States. States with larger populations have a higher proportion of CFO Movement. • California and Massachusetts have over twice the proportion of CFO Moves than they do of their percentage of the population of the United States. We believe this may be due to the higher proportion of growth companies (hi-tech and bio-tech/healthcare) in the market. Considering that most of the information we received for our CFO Blogs came from press releases in 2011, we found it interesting that the majority of companies (51.7%) were not publicly listed. • CFO Moves are not only reported by publicly listed companies, which are required to let their shareholders know about major executive moves, but are also reported by non-public companies. Do you have any insights or questions on these points that you would like to share? Please share your thoughts below. As CEO, Board Member, or VP of Human Resources of your organization, you may find yourself in a situation where you need to hire a CFO. Some companies take the decision to perform a search for their next CFO by themselves. This is a mistake. In past blog postings, I have detailed the reasons you cannot afford to hire the wrong CFO, asked if it’s time to replace your CFO and how do you replace your CFO? When you do a search for a Chief Financial Officer on your own, it is a misnomer to call it ‘search’. What you are really performing is a ‘look’. 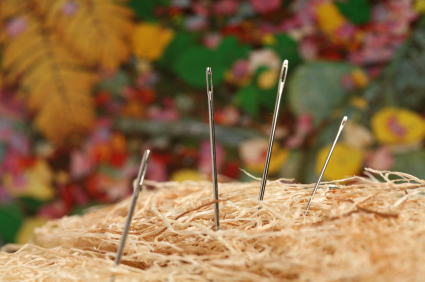 To find a needle in a haystack, ‘looking’ will not suffice – you need to do a proper, methodical search. And just because you find a needle, it doesn’t mean that it will be the right needle you need to get the difficult job done. • Works after your CFO is hired to ensure that they have the right support in place to succeed. • You have not done a proper Needs Assessment. Do you really know what knowledge, skills and abilities your next CFO needs? Are you making an assumption, or has an expert made you think more about what you really need? • You are missing the best CFOs. CFOs that are happy in their job are too busy to be looking at job postings. Without an active search, done by people experienced in gaining the attention of a busy CFO, you are missing what could be the best candidates. • You are tapping in to your network. This is a good thing. Except does your network really have access to the best CFO that you need? Can they attract the right CFO for your needs that is currently working and happy at another company? • The CFO you hire will not be a match. You’ve hired a square peg CFO to fit your round hole. If you have the important responsibility of being involved with hiring your organization’s next CFO, it is important to be honest with yourself. If you are not using a Search Firm for hiring your CFO, you are probably resigned to the fact that any CFO will do. 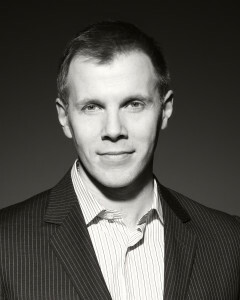 Would you like to receive Samuel’s CFO Blog directly in your email when he has a new blog? Click the SIGN ME UP! button on the right. Does a Small yet Growing business need a CFO? You might think that given what I do, I would say “of course”. I recently read a great piece by Janine Popick in the Huffington Post called Small Business CFOs: Do You Need One? In this article, Janine discusses the personal story of the growth of her company, Vertical Response, the challenges they faced as they were growing, and not having the right finance resources when they needed it. Janine’s honesty is refreshing. She mentions that there were numerous times she needed to take decisions to bring on the right finance resources, but her concerns of cost overrode her need to build value. She also admits there were things she did not know. The fact is many entrepreneurs of growing companies face the same issues. And make the same mistakes. I highly recommend this article to any entrepreneur who is building a growing business. So, does a small yet growing business need a CFO? If the business is small, growing and simple, I would say no. If the business is a complex business (where revenue is not a simple formula, where there is innovation in the product or service and where new investment is needed regularly to accomplish success) I would say yes. My recommendation to entrepreneurs of growth companies is: If you’re not sure, there are people you can ask. You can approach an entrepreneur of a successful growth business (like Janice) for their input. You can seek advice from the people that have invested money in your business (or people you hope will invest money in your business) for input. Or, as one entrepreneur did last week, you can ask me.